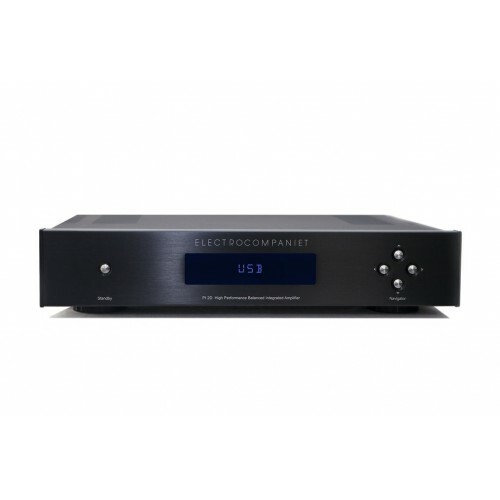 The Electrocompaniet PI 2D is a powerful entry-level integrated amplifier with a built in DAC. This way you can connect all your digital sources directly to the PI 2D and get away with fewer boxes and cables. The 24kHz/192 bit DAC and the modern technology in the PI 2D ensure that the music from all your sources will be reproduced with the best possible quality. The PI 2D has five digital inputs: two Coax, two Toslink and one USB. Analogue sources can be connected by one balanced XLR input and four single ended RCA inputs. In the development of PI 2D the focus has been to maintain the operating principles and sound quality of the classic line amplifiers and at the same time reduce manufacturing costs. To achieve this we have utilized modern surface mount technology (SMT) and optimized the amplifiers for our modern SMT production line. All functions are controlled by the remote control and the selected source is clearly visible on the large display.